Dianne Hatley serves Upper Deck very well as an account executive who works directly with our network of Certified Diamond Dealers throughout the U.S. and Canada. When I called her while she was representing the company at the 2012 NHL Draft in Pittsburgh, Pennsylvania and asked her if she could go on Cardboard Connection Radio, she happily agreed. On top of that, she did a fantastic job making sure Upper Deck’s 2012 NHL Draft Runner had an excellent time at the event. She also did great at making sure kids in attendance had a memorable experience at the Upper Deck booth. These are things she expected to do as it was part of her job and she enjoys it. But the real fun began when something she didn’t expect happened. A pleasant gentleman came up to her excited to see that Upper Deck had a presence at the NHL Draft and she knew she had seen him before. Maybe it was from his commercial. 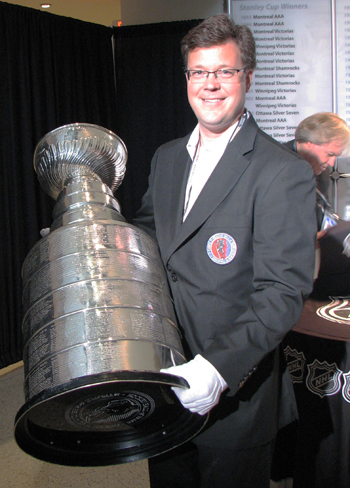 You see, Upper Deck has been working with Phil Pritchard (Vice President Curator of the Hockey Hall-of-Fame) and Craig Campbell (Manager of Resources & Archives of the Hockey Hall-of-Fame) in our “Day with the Cup” insert series. 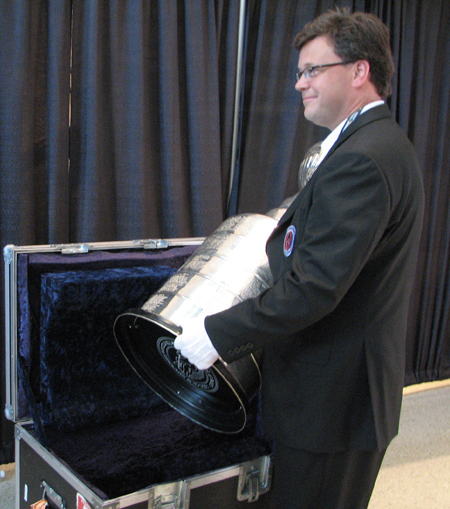 “The Keeper of the Cup,” as Phil is affectionately called, asked Dianne and the crew if they wanted to come over and check out all the hardware. Dianne explained they had to keep the booth manned so Phil invited them to come over when the show ended. 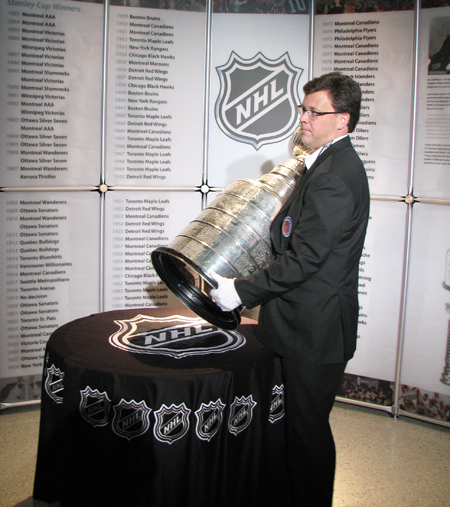 Upon arrival to the trophy area, it became immediately clear to Dianne that Phil takes great pleasure in his job and genuinely enjoys helping to bring fans closer to the game by experiencing the NHL’s greatest prize. 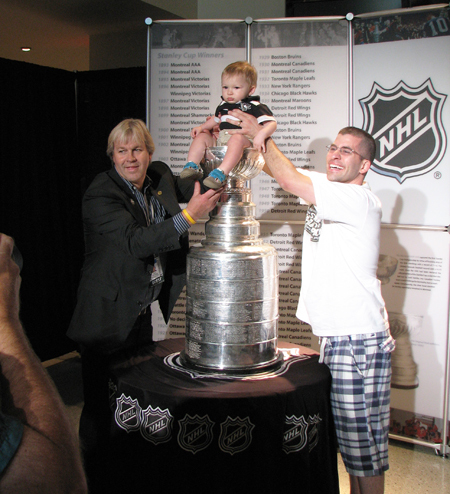 Phil helps a father take a VERY memorable picture with his son and the Stanley Cup at the 2012 NHL Draft. Phil and Craig made sure each member of the UD team got their picture taken with the Stanley Cup and other trophies on display. 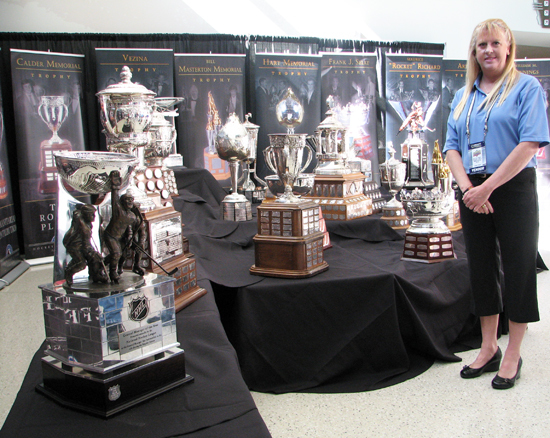 Dianne was able to get a great shot with all the awesome NHL trophies! 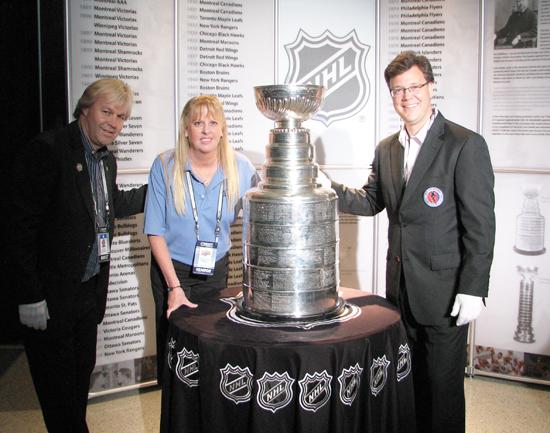 Dianne also got a great shot with the guys around Lord Stanley's Cup! And when it was finally time to lock the hallowed artifact away, Craig made sure the famous white gloves were of course on! 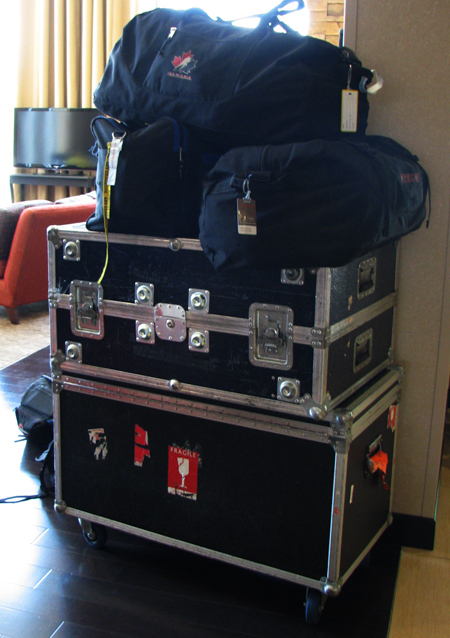 In this unassuming luggage is one of the greatest trophies in all of sports history! Phil and Craig didn’t have to be so nice to the Upper Deck team, but that is just genuinely how they are. That is pretty incredible they can keep such a great disposition considering how much they travel, but perhaps it is their love for their work that keeps them smiling throughout. For a really great read, make sure to check out their Stanley Cup Journal where you can see where the Cup is and how the Los Angeles Kings are spending time with it. It will also give you a preview to the 2012-13 NHL Upper Deck “Day with the Cup” set! You can check out photos like this of Anze Kopitar celebrating his "Day with the Cup" with David & Victoria Beckham on the Stanley Cup Journal! Check it out! Way to go Diane!!!! Salvatore loved the pics. He said they should have have you the white glovees!!! Thanks again for everything last weekend.